Slightly Oliver is a cocktail-themed Gastropub on the Upper West Side of Manhattan. Slightly Oliver is known for the tantalizing flavors and unique visual appeal of dishes that emphasize fresh, authentic ingredients in this New York City establishment; Teamed with the experise of Consulting Chef Jason Hicks and consulting mixoligist Orson Salicetti. It presents a combination of unique Gastropub cuisine and an apothecary-style bar with barrel-aged cocktails in a setting to match. The bar features a menu that changes seasonally to showcase ingredients at the peak of their freshness and the sounds of rock n’ roll and reggae. 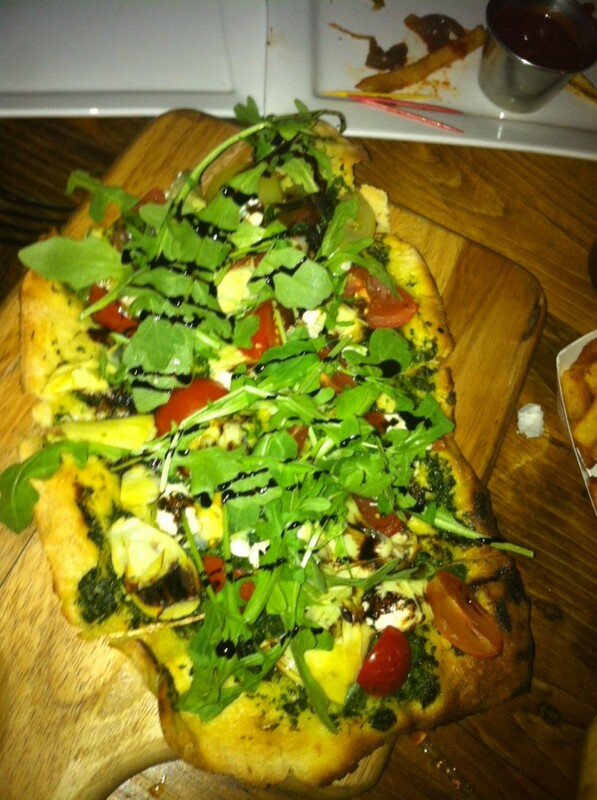 But one of the best offerings on the menu is their selection of $14 flat bread pizzas. Slightly Oliver in NYC has 3 different kinds of these pizzas to choose from currently and all are wonderfully fresh and delicious. Who would have guessed that an english gastropub could put out such good pizza. The choices were MARGARITA Fresh Mozzarella, Tomato, Basil sweet extremely fresh and tasty ARUGULA & GOAT CHEESE Artichokes, Spring Onion, Pesto, Balsamic. The balsamic against the goat cheese is heavenly and MEDITERRANEAN Olive Tapanade, White Anchovies, Arugula was my least favorite but if you love salty this one is definitely for you. The crust was a mixture of chewy and firm and it worked well with the arrangement of fresh toppings. My only complaint is that there were only three choices to choose from and they where eaten by everyone as fast as they hit the table. So if you go you might want to order more than one. Also they could be a wee bit larger for $14 but hey its Manhattan and the quality is superior to most. So all-in-all not an perfect slice but definitely a one of the better flatbread pizzas I have encountered, and great energetic atmosphere to boot! Slightly Oliver in New York City gets 7 out of 8 slices.